Best-selling author Francine Rivers skillfully retells the biblical love story of Gomer and Hosea as a tale set against the romantic historical background of the California Gold Rush. The main character, Angel, is a young woman who was sold into prostitution as a child. Michael Hosea, the hero, is a godly man who is sent into Angel's life to bring her God's love and truth, and to draw her into the Savior's redeeming love. New York Times best-selling author Francine Rivers (born 1947) began her literary career at the University of Nevada, Reno, where she graduated with a Bachelor of Arts degree in English and journalism. From 1976 to 1985, she had a successful writing career in the general market, and her books were highly acclaimed by readers and reviewers. Although raised in a religious home, Francine did not truly encounter Christ until later in life, when she was already a wife, a mother of three, and an established romance novelist. Five years after becoming a born-again Christian in 1986, Francine released Redeeming Love as her statement of faith. This retelling of the biblical story of Gomer and Hosea, set during the time of the California Gold Rush, is now considered by many to be a classic work of Christian fiction. The popularity of Redeeming Love continues unabated over a quarter of a century after its publication. Since Redeeming Love, Francine has published numerous novels with Christian themes - all best sellers. The Last Sin Eater, earned her the CBA Gold Medal award and has since been made into a feature film - She has continued to win both industry acclaim and reader loyalty around the globe. Her Christian novels have been awarded or nominated for numerous honours, including the RITA Award, the Christy Award, the ECPA Gold Medallion, and the Holt Medallion in Honour of Outstanding Literary Talent. 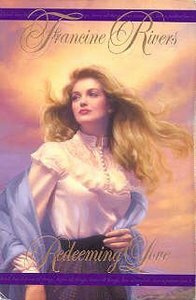 In 1997, after winning her third RITA Award for inspirational fiction, Francine was inducted into the Romance Writers of America's Hall of Fame. Francine's books have been translated into over thirty languages, and she enjoys best-seller status in many countries, including Germany, the Netherlands, and South Africa. Francine and her husband, Rick, live in northern California and enjoy time spent with their three grown children and taking every opportunity to spoil their grandchildren. Francine uses her writing to draw closer to the Lord, and she desires that through her work she might worship and praise Jesus for all He has done and is doing in her life. Customer Reviews For "Redeeming Love"
Not just a great read, but such a good reminder for us all about forgiveness and Godly relationships. Based on the book of Hosea, Redeeming Love gives us so many reminders about placing God first and not idolising our partners. A 'must read' for anyone entering into a relationship especially, to remind us to seek our first love first - God and keep Him as number one in our lives and relationships. This book has seriously redefined the meanig of GODLY LOVE for me, not only in terms of God's amazing love for us but in terms of an earhtly relationship such as marriage. This book is an essential read! This book is a "Must Read" ! I absolutely love this book and recommend it to anyone. I re-read this book every 2 years or so and always pick some new things out of it. I always try to read the book of Hosea in the Bible first before I dive into this book, so I can pick up more parallels and have a deeper understanding of the book. It tells so much about how God loves, sees and pursues us. Just beautiful ! I think that everyone should read this book. It retells the story of Hosea in an extremely interesting way. Once I had picked it up, I couldn't put it down again, it was so good. The novel shows God's work through Hosea, in bringing 'Angel' to the faith. I will definitely read it again. This book is very moving. It is hard to put the book down once you start reading. I have given this book as a gift to many people, both women and men to read, even ones that don't usually enjoy reading, and the overwhelming feedback has been that they were totally captivated, needed a box of tissues close by and could not put the book down. It is most likely the best Christian novel I have ever read and I read a book a week on an average and have done so for years.